Lisa Nichols talks about the three different types of relationships that we women find ourselves in. 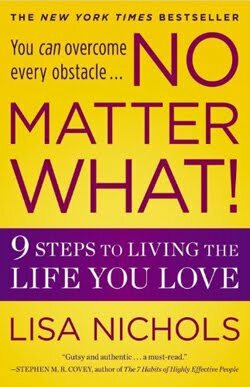 I am a fan of Lisa Nichols. She is a transformational speaker who seems to live up to her title in more ways than one. She oozes excitement and happiness. You probably know her from "The Secret" video that was publicized on Oprah years ago. She is also the author of a book entitled No Matter What! (review to come). 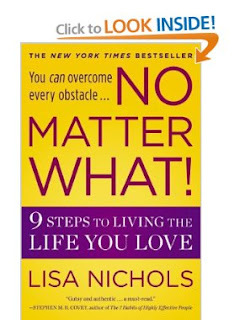 Lisa Nichols' Book No Matter What! 1) Some men come into your life for a short time so that you can feel alive again or so that you can learn healthy boundaries, to show you your worth or to teach you a lesson about yourself. 2) When a relationship ends, say it is complete. It has run its course and you have gotten what you need to get from it. 3) Every guy you meet and click with isn't meant to be your husband! The most important of her points was her discussion of the three types of relationships. She estimates that 80% of people are in a purposeful relationship and many just don't want to let go when it has served its purpose. Who said you have to find a man and get married by 30 (or else)? Here is a list of black women over 40 years old who found love later on in life, and guess what? They seem happy! As women we are constantly pressured to find a man and get married at age 25 (no later than 30!) or else it's all over for us, but guess what? A lot of women 40 and up are finding the "one," getting married and living awesome lives. If you've been beating yourself up about not being able to find someone special, maybe you should just... stop doing that. The pressure is what causes a lot of young women to jump into bad relationships where they are being abused, used for their resources and taken for granted. There is some evidence that people who get married later on in life tend to have longer, more fulfilling marriages. That's because the couple has had time to explore, find out what they want, establish themselves and learn who they are. Many black women have an added benefit because melanin in the skin keeps you looking young. So a black lady can be 50 years old and still look 30. That is a major asset. The main point is, your chances of finding love don't disappear when you turn 30 years old. And you can have love even if you've chosen to prioritize your career and pursue your dreams. Without further ado, I present to you a list of black women who found love and marriage later on in life after establishing their careers. Mellody Hobson is 43 years old as of this posting. She is a very successful woman in the financial field who made her own money at a young age. She is now the President of Ariel Investments, a billion-dollar financial firm. She was named one of Ebony magazine's "20 Leaders of the Future" and one of The Wall Street Journal's 50 "Women to Watch." 43-year old Ms. Hobson has been dating film producer George Lucas for over seven years and is now engaged to be married. Janet Jackson (Ms. Jackson if you're nasty!) is 46 years old as of this posting. She has been through a number of failed public relationships, including one with Jermaine Dupri, who let her slip right through his fingers and two marriages that ended in divorce (James DeBarge and Rene Elizondo). After a very successful career in music, television and film, Ms. Jackson is now married to Wissam Al Mana, a wealthy billionaire. Naomi Campbell is 42 years old. Not everyone is happy about the fact that she is in a relationship with Russian businessman Vladislav Doronin because she met him while he was still married, but reports state that he and his wife were separated for 10 years before the relationship began. Nonetheless, Naomi seems to have now found love at 42. Naomi strutted that catwalk like she owned it for years and made her money. Now she can enjoy her own personal wealth while living the good life in Moscow with her long-time boyfriend. When you think of failed celebrity relationships, Halle Berry is somewhere up there at the top of the list. Halle was one of those women who seemed so desperate for love that she jumped into a new one like it was an inviting pool of water. But at the age of 46 (as of this posting), Halle is now engaged to be married to Olivier Martinez, a French actor who is willing to fight for her (literally). She was about 38 when she got married, but actress Angela Bassett is still a great example of how you can still find love when you get older after establishing your career. 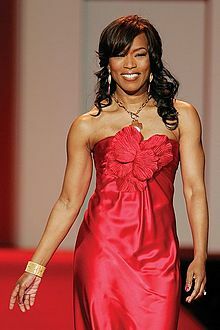 Angela is a queen among black women, having nailed a number of important acting roles, including her portrayals of Tina Turner in What's Love Got to Do With It and Betty Shabazz in Malcolm X. Sister did her thing, made her money, still looks great, and at 54 she is still with her husband actor Courtney B. Vance. 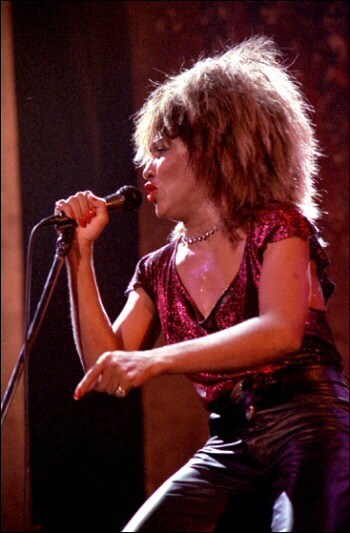 As of this posting, Tina Turner is 73 years old ya'll, and still looks about 40. She got married at a fairly young age, and we all know how that story goes. No need to elaborate. But she persevered. She built a successful music career, made her millions, achieved legend status and then moved to Switzerland to enjoy the good life. At 73 Ms. Turner is getting married to her long-time beau, Erwin Bach, who is almost 20 years younger. There are plenty more older black women who aren't as famous who are finding love later on in life. So when you are feeling down and out about not finding the right one for you, just remember these women; our older sisters and elders. They found love, marriage and happiness with their mates at 40+. Of course, no one can predict the future and whether these unions are forever, but the point is that their opportunities for meeting someone special didn't cease at age 30. Keep in mind that a lot of women who force marriage at age 25 become miserable because they were way too eager and focused on finding a man. Don't be like them. Relax. Enjoy your life as a single woman. Hang with friends. Listen to motivational videos. 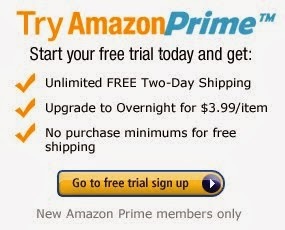 Watch positive or educational media (movies, TV shows, Netflix etc). Work on your business idea. When you have a "no pressure" mentality, you are less likely to settle for scraps. You deserve "simply the best" baby. Opinion: young black women and girls should spend less time obsessing over finding a man and more time pursuing their dreams. Yea, I said it. I've been concerned even more than usual about how obsessed some black girls and young black women are with love and relationships, to the point where they think that finding a man will make their lives worth living. They prioritize pursuing a romantic relationship over pursuing their dreams and it doesn't help that the young guys they're interested in seem to get more and more disrespectful and apathetic each day. It also doesn't help that women who are "growner" than them also seem way too focused on finding a man to marry over all the other beautiful things there are to enjoy in life. I know I might be stepping on some toes with these comments but I don't think I care anymore? I am tired of seeing young black girls playing themselves for boys who couldn't care less about them and aren't giving them back the same energy. I'm tired of the rehashed articles posted every week on black media about how black women should go about finding and keeping a man (yet none of them seem to be helping). And if you've read this blog before, you know I'm all the way over faux relationship "experts" (some who are not even in a solid relationship themselves) wagging their fingers at single black women. I think that what prompted me to write about this issue was hearing about what happened to the beautiful Porsha Williams (Stewart) of The Real Housewives of Atlanta. I haven't watched the show this season, but from what I read she bent over backwards to please her oppressive husband and play the submissive role, yet he still publicly dumped her like some trash put out to the street. She doesn't deserve that. And no one ever wants to talk about what the guy may be doing wrong to cause the break down in a relationship. There are a lot more Porshas out there, hanging on by a string and willing to do or take just about anything just to have the title "Mrs." So I decided that I want to present black girls and women with a different perspective on love and relationships at this blog going forward. If you don't agree that's fine -- there are plenty of other sites that will beat the subject of how to find or attract a man to death, revive it, and then beat it down some more! Clarification: This is not a "we don't need no man" blog, this is a "yes we need love, but we refuse to let the pursuit of love consume our lives" blog. I welcome guest bloggers who understand this. This particular relationship blog is about having a healthy perspective when it comes to relationships, and not just with men but also concerning friendships, co-worker, strangers you meet on the street and family members. My overall message to young black women: love is great love is divine, but if you focus too much energy on finding it, it just might kick you in your behind! In other words, RELAX. Live your life. Find happiness from within. If an awesome guy comes along in the midst of all of that, cool! Snap him up and live happily ever after together. Finding a man and getting married shouldn't feel like a 50-yard dash to the finish line. Slow and steady wins the race. One last note to young women: men shouldn't complete you, they should supplement your already amazing life. In the next post I will present to you a list of successful black women who found love later on in life after establishing a platform for themselves. Love and relationship "experts" are popping up like dandelions online. But is their current strategy really helping anyone? From time to time I'll receive a retweet on my Twitter timeline from a relationship "expert." All too often these online "experts" are men and all too often their advice is directed only to women. The advice is usually very blunt and accusatory in nature. Steve Harvey and crew have given these guys a clear runway to take off into oblivion and reinvent themselves as relationship "experts," even when they don't have a successful, loving relationship with a woman themselves! Please stay in your own lane. No this is not meant as a finger snap in your face. It's a serious suggestion. If you are a black man who feels you have had some level of success in life and knowledge of how to have a successful relationship, talk to your fellow black men about it. How can a man like you make his relationship work? And vice versa for black women. But as a side note, when have you ever seen a black woman giving unsolicited relationship advice to black men? Let alone an unmarried black woman who is not in a healthy and loving relationship herself? That's unheard of, right? I do believe that certain types of men simply get a twisted pleasure and satisfaction from criticizing and shaming women, particularly black women. I think it's a veiled way for men to bash women while pretending to want to help. But I also get that the real reason why these male relationship "experts" focus their attention on women is that unfortunately women are the only ones who are willing to pay them any attention. A man doesn't really want any of what they're selling. So if one of these "experts" wanted to sell a book or tape series on how to have a relationship, they know that their target audience is going to be "desperate and lonely women of all ages." But if you're a black man who is sincerely interested in HELPING people build better relationships, then your efforts are best focused on giving helpful advice to other black men who may be struggling with how to talk to and deal with women. You can't shame and blame anyone into submission -- especially not a grown person. Ask any real relationship expert and they will tell you that. It is also extremely difficult to get through to someone if you can't really relate to what they're going through or what they've been through. Even if the message that you're offering has merit, you may not be the right messenger. Think about this for a moment: someone may have a very true message about saving the black community, but if it comes from the lips of a condescending white person who has never even set foot in a black neighborhood, we don't want to even hear it. A black woman better understands the stresses, concerns, troubles, fears, challenges and dreams of other black women. For that reason I believe that a black woman who is in a healthy and happy relationship is best equipped to successfully give relationship advice to another black woman. Black men also need a strong male influence if they want to build a successful relationship with someone. So I believe that a black man who is in a healthy relationship is best equipped to give relationship advice to another black man. Lastly, let's quickly explore this label of "expert." Just because you have something to say on a matter doesn't make you an expert yet. It takes years of training, reading, studying, meditating, and loads of life experience to earn that title. How many lives have you changed? How many strong relationships have you helped build? How many successful marriages have you helped create? Isn't that what defines an expert: results? However, even if you can't truly call yourself an expert yet you still might have good insights to offer others. If you truly want to help, offer it to those who you can best relate to and who can relate to you. 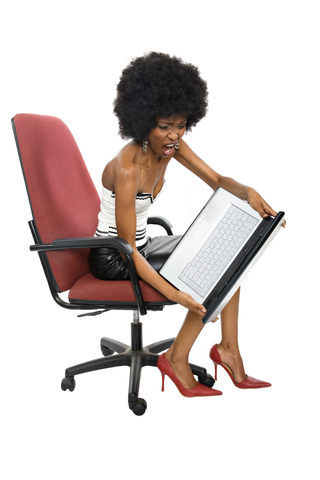 Would you like to write a relationship article for the Classy Black Lady relationship blog? Submit your inquiry and pitch here.